...Providing the whole story behind tobacco and alcohol news. As the Senate prepares to pass a health care reform bill, the similarities between the process that led to this legislation and the analogous process that led to the passage of the Family Smoking Prevention and Tobacco Control Act have become striking. In both cases, policy makers and health groups have put their principles up for sale. In order to secure the votes perceived to be needed to pass the legislation, these politicians and health organizations have sold out the protection of the public's health for votes. They have caved in to special interest groups, making compromises that have rendered the resulting legislation more harmful than beneficial. And in both cases, beginning the process of crafting legislation by negotiating with Big Industry led to the demise of the legislation in the first place. The FDA tobacco legislation was crafted through a negotiation between the Campaign for Tobacco-Free Kids and Philip Morris. The starting point for the process of drafting the legislation was inviting Philip Morris to the negotiating table. An a priori decision was made that the support of Philip Morris was necessary in order to ensure the legislation's passage. Thus, compromises had to be made to appease the nation's leading tobacco company. But by the very necessity to appease Philip Morris, the Campaign for Tobacco-Free Kids and its supporting politicians ensured that the resulting legislation would protect Big Tobacco profits, not the public's health. The health care reform legislation was crafted through a negotiation between the leading policy makers and the hospital, insurance, and pharmaceutical industries, mediated or directed by the Obama administration. The starting point for the process of drafting the legislation was inviting the hospital, insurance, and pharmaceutical industries to the negotiating table. An a priori decision was made that the support of these industries was necessary in order to ensure the legislation's passage. Thus, compromises had to be made to appease the nation's leading opponents to the idea of controlling health care costs. But by the very necessity to appease these groups, President Obama and his Congressional leaders ensured that the resulting legislation would protect Big Pharma and Big Insurance profits, not the public's health. allowing reduced exposure products to be marketed without sufficient evidence of reduced risk. requiring consumers to pay separately for abortion coverage and other medical coverage if they receive federal subsidies for medical insurance. In addition to these compromises, crafters of the health care reform legislation literally bought the votes of many Congressmembers by offering them sweetheart deals, none of which were in the best interest of citizens throughout the nation. The Campaign for Tobacco-Free Kids compromised basic public health principles in order to promote and secure passage of the FDA tobacco legislation. To start, the Campaign engaged in a widespread campaign of deception to mislead its constituents into thinking that Big Tobacco was uniformly opposed to the legislation and that all Big Tobacco lobbyists were working hard to defeat the legislation. The Campaign also compromised the principle of transparency by secretly negotiating with Philip Morris behind closed doors. Furthermore, the Campaign sold out the interests of the African American community by using the menthol exemption as a bargaining chip to secure the bill's passage, even though it failed to seek input from the African American community and failed to alter its support for the menthol exemption even after African American tobacco control groups and members of Congress expressed their outrage. The Campaign showed a disregard for any public health principles throughout the process. It was simply about getting some legislation passed, no matter what was actually in the legislation. The Campaign stated that Big Tobacco has no business using flavorings to entice kids. Yet the Campaign insisted that Big Tobacco be allowed to continue enticing kids by using menthol in its cigarettes. While the Campaign's legislation eliminated a total of ZERO flavored Big Tobacco products from the market, it exempted the single most important type of flavored product that is addicting our nation's children: menthol cigarettes, which are smoked by nearly half of youth smokers. The Campaign also violated the rights of youths by misusing them to promote the FDA legislation, without informing them that the bill was crafted by and supported by the nation's leading cigarette company. With the health care reform bill, politicians have compromised women's rights for their personal political gain. Legislators have essentially overturned a Supreme Court decision (Roe v. Wade) by allowing states to prohibit insurance companies from covering abortion. This is clearly unconstitutional (or will be as soon as a state follows through), as there is no valid public interest in proscribing the types of medical coverage that can be offered by a private insurance company. This goes way beyond the restriction of the use of federal funds for abortion. This is allowing states to proscribe the services that cannot be covered by private insurers. Legislators have literally put their principles up for sale, compromising even their stated principles for political gain. Right here in my home state of Massachusetts, U.S. Senate candidate Martha Coakley compromised her stated principles in order to jump on the health care reform bandwagon. During the Democratic primary race, she castigated Rep. Michael Capuano for voting for the health care reform bill even though it restricted medical coverage for abortion. She stated that on principle, she would not vote for any bill that interfered with a woman's right to abortion. However, now that she has won the Democratic primary and is facing a conservative opponent, she has reversed course, and now states that she would vote for the very bill that provides unprecedented restriction of a woman's right to an abortion, so much so that it clearly violates the Supreme Court's decision in Roe v. Wade. Most ironically, while supporters of health care reform vehemently defended their legislation against complaints that it represented Big Government control of medicine, by compromising with special interests from Big Uterus Control, they have now turned this legislation into the most aggressive and intrusive example of Big Government intrusion into private medical decisions ever enacted in the history of our federal government. In both the case of the FDA tobacco legislation enacted by Congress earlier this year and the health care reform bill which is about to be passed by the Senate, policy makers and health groups have put their principles up for sale. In order to secure the votes perceived to be needed to pass the legislation, these politicians and health organizations have sold out the protection of the public's health for votes. They have caved in to special interest groups, making compromises that have rendered the resulting legislation more harmful than beneficial. And in both cases, beginning the process of crafting legislation by negotiating with Big Industry led to the demise of the legislation in the first place. The lessons from tobacco control should have helped to inform the health care reform debate. Instead, the mistakes that were made in tobacco control were repeated in health care reform, and as a result, we now have legislation that violates public health principles and human rights, has elements that are or will result in unconstitutionality, and that will do more harm than good. In both cases, the overall goal appears to be the achievement of political gain by being able to say that politicians and health groups have done something. The something doesn't seem to matter. All that matters is that something got passed. In both cases, the protection of the public's health, the protection of human rights, basic ethical principles, and the willingness to stand up for principles were all compromised for little more than political gain. In the end, the American people will suffer while the real problems - tobacco use and health care costs - have not been addressed. But at least our politicians can walk away and say that they did something. Today, the Rest of the Story announces the recipients of the 2009 Lie of the Year Award, as well as the runner-ups, who are awarded the Pants on Fire Runner-Up Awards for 2009 (apologies to Politifact.com for borrowing these designations). The Lie of the Year Award is presented each year to the anti-smoking organization which communicates the most inaccurate information to the public. The award is based not merely on having lied to the public, but also on the significance of the scientific or factual distortion in terms of its public health or public policy significance. Special consideration is given to organizations which are made aware of the factual inaccuracies but which continue to disseminate the false information to the public. This year's Lie of the Year Award is presented to Smoke Free Wisconsin for its public communication which informed readers that electronic cigarettes are a Big Tobacco ploy to hook kids. On March 25, 2009, the anti-smoking organization SmokeFree Wisconsin accused tobacco companies of using electronic cigarettes as a ploy to hook youths on these products. The group asserted that these products are being marketed to kids by virtue of their being produced in fruit flavors. For these reasons, SmokeFree Wisconsin joined a number of other health groups in supporting efforts to remove electronic cigarettes from the market. SmokeFree Wisconsin wrote in its blog entry entitled "E-cigarettes: The Latest Ploy By Big Tobacco to Hook Kids": "A recent call to our office prompted us to look further into the emerging issue of 'e-cigarettes.' A group of public health advocates has urged the Food and Drug Administration (FDA) to pull e-cigarettes (or electronic cigarettes) from sale in the United States. ... E-cigarettes are often made to look like conventional tobacco products and are marketed to kids by producing them in fruit flavors. A united group of public health advocates, including the American Cancer Society Cancer Action Network, American Heart Association, American Lung Association and the Campaign for Tobacco-Free Kids, sent out a press release commending Senator Frank Lautenberg of New Jersey for demanding that the FDA remove e-cigarettes from the marketplace. FDA officials have been quoted in the past few weeks saying e-cigarettes are a 'new drug' that needs to be approved by the government before it can be sold." Despite immediate responses from readers noting that electronic cigarettes are not produced by tobacco companies and therefore cannot possibly be a "Big Tobacco" ploy and despite several emails to the organization from me informing the group that its claim was false, Smoke Free Wisconsin failed to correct its post for at least six months. Finally, Smoke Free Wisconsin relented and changed the title of its post. However, it issued no clarification, correction, or apology for the error and did nothing to highlight or call out the error. The lie is significant because the removal of electronic cigarettes from the market would be devastating to the public's health. It would result in a return to cigarette smoking by perhaps hundreds of thousands of ex-smokers who now rely on vaping to keep them off of tobacco products. Many of these people have experienced substantial improvements in their health, which would compromised and reversed if they are forced to return to smoking. Thus, the false information disseminated by Smoke Free Wisconsin could have contributed to a public policy that results in increased disease and death. Not a small price to pay for the lie of the year. The first Pants On Fire Runner-Up Award is presented to the American Cancer Society for falsely informing its constituents that a bill passed by the New York State Assembly bans flavored cigarettes, when in fact it exempts menthol cigarettes, which account for nearly half of the cigarettes consumed by underage youths. On its web site, the American Cancer Society (ACS) stated that it was supporting a ban on flavored cigarettes, which it asserted have long been used by tobacco companies to lure kids into smoking. According to the ACS: "Candy, fruit and liquor-flavored cigarettes are smoked by school children in much higher numbers than adults. Cigarette makers have long seen sweetened cigarettes as a lure for catching young customers. The American Cancer Society supports a ban on these dangerous products." The ACS also stated: "A bill to eliminate flavored cigarettes passed the [New York] State Assembly in early 2009 and awaits action. We are hopeful this bill can become law this year." However, the bill passed by the New York State Assembly does not ban flavored cigarettes. It does not, for example, ban menthol-flavored cigarettes. It does not ban clove cigarettes. What it bans are a number of types of cigarettes that were already taken off the market several years ago. There is not a single brand of flavored cigarettes produced by Big Tobacco which is covered by this legislation. But what the bill does is specifically allow the most common flavored cigarettes - menthol and clove cigarettes - to remain on the market. This lie is significant from a public health perspective because it deceives constituents into thinking that the state legislation will eliminate flavored cigarettes from the market and thus curtail the enticement of youths to smoking via flavored products. Unfortunately, nothing could be further from the truth. The bill removes absolutely no cigarettes from the market (as the FDA legislation already eliminated non-menthol flavored cigarettes) but it allows menthol cigarettes, which are smoked by nearly half of teenage smokers - to remain on the market. There may be a way to deceive one's constituents more about a public health issue, but I'm not aware of how. The American Cancer Society solidified its first runner-up position by also lying to its constituents in another communication, this one also claiming that a piece of legislation - the federal FDA tobacco legislation - banned all flavored tobacco products when in fact the flavored cigarettes enjoyed by half of all youth smokers - menthol cigarettes - were exempted from the ban. In a communication sent to the American Cancer Society's (ACS) network of advocates throughout the nation (including myself) and posted on the Society's web site, the ACS lied about the effects of the FDA tobacco legislation passed by the U.S. House and Senate and signed into law by President Obama. According to the American Cancer Society's statement: "Our nation's children – potential first-time smokers – will no longer be seduced by flavored tobacco products, including candy- and fruit-flavored cigarettes, which will be banned." The American Cancer Society is thus claiming that the FDA tobacco legislation bans all flavored tobacco products that might seduce children. If the American Cancer Society had read the actual text of the legislation or read any of hundreds of newspaper articles about the bill published in the past month alone, it would have easily found out that the bill does not ban all flavored tobacco cigarettes that seduce young smokers. The bill specifically exempts menthol from its ban on cigarette flavorings. The second Pants On Fire Runner-Up Award for 2009 goes to the Institute of Medicine Committee on Secondhand Smoke Exposure and Acute Coronary Events for claiming that it conducted a comprehensive review of unpublished data on the relationship between smoking bans and heart attacks when it failed to review any unpublished data in its report. The IOM committee states that it did not consider the data from these nine states or countries because they were unpublished. In an email, a committee member states: "The data from England, Scotland and Wales and their analyses referred to in your email are not found in the peer-reviewed literature and, therefore, were not reviewed in the committee’s report. It was beyond the scope of our study to seek out data available from all the municipalities, counties, states or countries that might be relevant to smoking bans and to conduct our own original studies." In another email, a committee member acknowledges that he had not even seen the relevant data referred to above. It seems clear that the committee did not consider these unpublished data in its report. However, the press release states: "The IOM committee conducted a comprehensive review of published and unpublished data and testimony on the relationship between secondhand smoke and short-term and long-term heart problems." If the report failed to consider the unpublished data and at least one of the committee members acknowledges not having even looked at that data, then why does the press release untruthfully state that the committee conducted a comprehensive review of unpublished data? How comprehensive a review is one in which the data are apparently not even examined? How comprehensive a review is it if the unpublished data are not even mentioned in the report? The committee is of course free to restrict its analysis to published data, but you can't have it both ways. You can't restrict your analysis to published data and then lie to the the public and tell them that you comprehensively reviewed the unpublished data as well. Why not just tell the truth and state that you examined only published data, not unpublished data? This lie is very significant, because it is the difference between an accurate and an inaccurate conclusion on whether smoking bans produce immediate, dramatic reductions in heart attacks due to a reduction in secondhand smoke exposure. With the unpublished data, it is very clear that there simply is no valid way to conclude that smoking bans produce such an effect. Even without the unpublished data, it appears that one cannot conclude that there is any effect. But the point here is simply that the IOM Committee misled the public when it stated in its press release that it included a comprehensive review of unpublished studies in its review, but acknowledged in separate communications that unpublished data were specifically excluded from the review of the effect of smoking bans on heart attacks. The third Pants On Fire Runner-Up Award is presented to Breathe California of Sacramento-Emigrant Trails for its continuing assertion that smoking kills 340 young people a day (124,000 young people each year). Breathe California of Sacramento-Emigrant Trails has been aware of this inaccurate statistic on its web site since at least October 22, 2007, when I first notified the group of the error. If this were just an innocent mistake, I think it would be reasonable to assume that the organization would quickly change the web page to correct the mistake. However, as you can see, the "mistake" persists to this day. In fact, several months after I first wrote to the group, asking why they hadn't yet changed the web page, I was told that the reason for the failure to correct this statistic was that the web master was unavailable (presumably on vacation). All I can say now is that it's been one heck of a long vacation: from October 22, 2007 to December 20, 2009. That's 26 months - more than two years! I would love to have that web master's job. The fourth Pants On Fire Runner-Up Award is presented to the Canadian Non-Smokers' Rights Association (NSRA) for falsely accusing Citizens Against Government Encroachment (CAGE) of being funded by Big Tobacco. In a document entitled "Exposing Recent Tobacco Industry Front Groups and Alliances," the Canadian Non-Smokers' Rights Association (NSRA) accused CAGE of being a Big Tobacco front group. The document, dated March 2008, defined a "front group" as being an industry-funded group that in some way hides its funding or its vested interest. In particular: "By operating in the shadows cast by Big Tobacco, industry-funded front groups make it difficult to determine whether these 'grassroots' organizations are truly independent or representing some other entity or vested interest." The Non-Smokers' Rights Association adopted the following definition of "front group," which is taken from the SourceWatch encyclopedia: "A front group is an organization that purports to represent one agenda while in reality it serves some other party or interest whose sponsorship is hidden or rarely mentioned." Thus, as NRSA defined it, a front group is funded (sponsored) by a third party whose interests are being directly served in a concealed way. However, NRSA provided not a shred of evidence that CAGE receives tobacco industry funding or is in any way associated with the tobacco industry. To its credit, NRSA did remove the document from its web site. This lie is notable not because of its public policy significance, but because the false claim was an arguably defamatory one. It demonstrates the lengths to which some anti-smoking groups are willing to go to sling mud in the faces of anyone who opposes them. The fifth and final Pants On Fire Runner-Up Award for 2009 goes to Weill Cornell Medical College for falsely claiming that an apology was made for its investigators' failure to disclose a significant conflict of interest in their article on the role of low-dose CT scans in screening for lung cancer. The story began when two Weill Cornell Medical College researchers failed to disclose two important conflicts of interest in an article they published about the use of CT scanning in early detection of lung cancer. Even after being publicly scolded by the New England Journal of Medicine for her failure to disclose the tobacco industry funding of her research on the use of CT scans in lung cancer screening and her significant financial interest in this technology (she receives royalties on intellectual property she invented which involves the use of CT scanning for early diagnosis of lung cancer), the lead researcher from Weill Cornell Medical College and the school itself defended her failure to provide these disclosures. In a statement released by Weill Cornell Medical College on April 4, the school not only defended the researcher in failing to disclose significant financial conflicts of interest to medical journals, but it also blamed the New York Times for inaccurate reporting. According to the statement: "As you may know, an article appeared last week in The New York Times (Mar. 26, 2008) alleging that two Weill Cornell Medical College (WCMC) researchers did not fully disclose that their research on the use of CT screening for the early detection of lung cancer was partially funded by money from a tobacco company, and did not properly disclose the existence of the Foundation that received the funds. We believe the article did not present a complete picture of the facts and that its primary conclusion -- that Weill Cornell intentionally attempted to conceal the gift in the Foundation -- is simply wrong." The statement then goes on to argue that Liggett's gift to the Foundation which funded the research was widely publicized at the time the donation was made. It also argues that the failure to disclose the tobacco industry funding was not intentional. In terms of the failure to disclose the researcher's financial interest in the use of CT scans for lung cancer detection (she apparently receives royalties from General Electric after the licensing of the patents to GE), Weill Cornell Medical College defends the disclosure failure on the grounds that "Henschke and Yankelevitz did not use the GE products developed under the licensing agreement as part of the I-ELCAP, and did not require participating I-ELCAP institutions to use the GE product." The statement also contends that the researcher published a public apology in the New England Journal of Medicine. According to the statement: "Some of those publications have disagreed with Dr. Henschke and Dr. Yankelevitz's judgment on these, and corrections and apologies have been published in those journals." I find this to be a truly pathetic attempt to defend what was clearly an inappropriate failure to disclose two important conflicts of interest. First, the funding by the tobacco industry needs to be disclosed in the article itself, and to the journal. It is not enough to expect that the journal editors will look up the Foundation for Lung Cancer on the internet and search newspaper articles to try to find out who the Foundation's donors are. I do not believe that Dr. Henschke can hide behind the excuse that she disclosed funding from the Foundation for Lung Cancer: Early Detection, Prevention & Treatment, and so that she did indeed disclose her funding sources. The intent of disclosure of funding is to provide editors, reviewers, and the public with relevant information about the source of funding, not merely to provide the name of the foundations or entities set up to receive that funding. Thus, I view the failure to disclose her funding from Liggett as a significant violation of ethical standards of conduct. This defense is inadequate and it is unfortunate that the researcher is not willing to take responsibility for this failure. In many ways, I find this defense to be a worse offense than the original disclosure failure. To make a mistake is human, and perfectly acceptable if you admit your mistake, apologize, and learn from it. But to deny that there was any mistake and to worm around, trying to convince the public that you have indeed disclosed the funding when you haven't, makes the original offense even worse. Second, whether Dr. Henschke used GE products in her research or not is immaterial to the question of whether her financial interest in General Electric represents a conflict of interest. It is not a conflict of interest because she is using GE products; it is a conflict of interest because she has a financial interest in a company which stands to gain financially from the widespread use of CT scanning for early detection of lung cancer. Thus, there would be a significant financial conflict of interest even if this research employed only CT scanners made by other manufacturers. Again, this attempt to confuse the public and obscure the underlying issue is quite unfortunately. And again, I find this aspect of the defense to be worse than the original failure in disclosure. To make matters even worse, it appears that the statement is dishonest in asserting that an apology was published in the New England Journal of Medicine. Two corrections were published. In the first, the author writes: "In our article published in the October 26, 2006, issue of the Journal, one of the disclosed sources of funding was the Foundation for Lung Cancer: Early Detection, Prevention and Treatment, which provided partial support for our research. For full transparency we wish to inform you that $3.6 million (virtually all of the Foundation's funding) was contributed in 2000 through 2003 as an unrestricted gift by the Vector Group, the parent company of Liggett Tobacco, which manufactures cigarettes." No apology is offered, nor is any wrongdoing admitted. In the second correction, the Journal writes: "The disclosure statement (page 1769) should have read as follows: 'Drs. Henschke and Yankelevitz report receiving royalties from Cornell Research Foundation as inventors of methods to assess tumor growth and regression on imaging tests for which pending patents are held by Cornell Research Foundation and licensed to General Electric. No other potential conflict of interest relevant to this article was reported.'" Again, no apology is offered here. So unless I am missing something, it appears that the Weill Cornell Medical College statement is dishonest. There is no apology that I can find in the New England Journal of Medicine for these two failures in disclosure. I would have a lot more respect for the Weill Cornell Medical College and the involved researchers if they simply admitted that a mistake was made and apologized for it. That would be the end of the story. We all make mistakes and we can learn from them. However, instead of admitting a mistake and apologizing, the researcher's and the school's response has instead been to deny wrongdoing, obscure the issues, hide behind immaterial points that will confuse the public, and to go so far as to attack the New York Times for its reporting of the issue. So let's now get to that important issue. Cornell is attacking the New York Times for falsely implying that the failure to disclose the tobacco industry funding of the research was intentional. Well, if it wasn't intentional, then Cornell must be claiming that there was simply a mistake. The investigator intended to disclose the tobacco funding, but somehow forgot to do so. Unfortunately, that is clearly not the case in this situation (at least, it's not what Cornell states is the situation). Cornell is not advancing a position that Dr. Henschke revealed the tobacco funding of the research to the Journal, but the Journal just forgot to publish it. Nor is Cornell suggesting that Dr. Henschke intended to disclose the tobacco funding but simply forgot or neglected to include it in her manuscript. It seems quite clear that the failure to disclose the tobacco industry funding was indeed an intentional failure. There was no intent upon the part of Dr. Henschke to inform the New England Journal of Medicine and the readers of the article that this work was funded by a grant from Liggett. Had the intent been to make readers aware of the tobacco funding, then Dr. Henschke would have revealed that funding. So I believe that the New York Times was in fact entirely correct in asserting that the failure to disclose the tobacco funding was intentional. In closing, I have to say that the original failures to disclose the tobacco funding and the royalties from the patents licensed to General Electric pale in comparison to Weill Cornell Medical College's attempt to defend, obscure, and apparently - to lie - about aspects of the issue at hand. If they simply came out and said: "We made a mistake. We're sorry," that would be the end of the story and I would have great respect for them. Instead, I think they have made a public disgrace of themselves. This ethics failure is an important one because the public policy and public health implications of the failed disclosure and of the investigators' apparent bias in hyping the value of CT screening for lung cancer is immense. A set of recent articles published in the Archives of Internal Medicine report that CT scans expose patients to significant levels of radiation which produces an increased risk of cancer. As the article notes: "What is becoming clear, however, is that the large doses of radiation from such scans will translate, statistically, into additional cancers. With CT scan use increasing annually, it is imperative that clinicians take into account the radiation risks when assessing the benefit to their patients. ... 15 000 persons may die as a direct result of CT scans physicians had ordered in 2007 alone. Presumably, as the number of CT scans increase from the 2007 rate, the number of excess cancers also will increase. In light of these data, physicians (and their patients) cannot be complacent about the hazards of radiation or we risk creating a public health time bomb." The paper concludes: "The articles in this issue make clear that there is far more radiation from medical CT scans than has been recognized previously, in amounts projected to cause tens of thousands of excess cancers annually. Also, as these scans have become more sensitive, incidental findings lead to additional testing (and often more radiation), biopsies, and anxiety. Although a guiding principle in medicine is to ensure that the benefit of a procedure or therapy outweighs the risk, the explosion of CT scans in the past decade has outpaced evidence of their benefit. Although there are clear instances when CT scans help determine the treatment course for patients, more and more often patients go directly from the emergency department to the CT scanner even before they are seen by a physician or brought to their hospital room. To avoid unnecessarily increasing cancer incidence in future years, every clinician must carefully assess the expected benefits of each CT scan and fully inform his or her patients of the known risks of radiation." Given the large degree of human health risk that arises from the widespread use of CT scans to screen for lung cancer, it becomes inexcusable that the Cornell authors failed to disclose a financial conflict of interest, hiding from readers the fact that the lead investigator stands to benefit financially from the widespread adoption of this technology. This is precisely why financial disclosure of conflicts of interest is required by the federal government and by medical institutions and this story shows the damage that can be done if schools and researchers do not take these ethical requirements seriously. While mistakes occur, and they are excusable if the institution and researchers acknowledge the mistake and apologize, there has been no acknowledgment of any wrongdoing in this case, nor has there been any apology. Simply weak excuses and a defense of what is clearly wrongdoing. In an effort which was purported to be motivated by a desire to reduce the town's health care costs, officials in Amherst, New York decided to pursue the idea of refusing to hire smokers. However, the effort was quickly thwarted when the town's human resources director informed the Council that the state of New York prohibits employers from considering tobacco use in the privacy of one's home as a condition for employment if it is not a bona fide requirement for that employment. It's also very frustrating to get people to become healthy by losing weight and engaging in physical exercise. It's much easier to simply refuse to hire overweight people and people who do not exercise regularly. But you don't see the Council proposing to refuse to hire overweight and obese individuals. In my opinion, they are picking on smokers specifically because there is an underlying hatred of smokers and an attempt to control their lifestyle. Employment discrimination is discrimination and there is no place for it in the workplace. Period. Fortunately, New York State has a law in place which prohibits this type of discrimination. Error Disclosed in Meta-Analysis of Smoking Bans' Effect on Heart Attacks: Will Anti-Smoking Groups Report the Error? In October, Dr. David Meyers and colleagues published a paper in the Journal of the American College of Cardiology in which they reported the results of a meta-analysis of published studies on the effect of smoking bans on heart attack admissions. The paper concluded that smoking bans were associated with a 17% decline in heart attack admissions in the 11 studies that were reviewed. These results were disseminated widely in the media and heavily touted by anti-smoking groups as supporting the conclusion that smoking bans immediately and dramatically reduce heart attacks and that brief exposure to secondhand smoke in bars and restaurants causes a large number of heart attacks. According to an article in the Lawrence Journal-World & News, Dr. David Meyers, professor of cardiology and preventive medicine at Kansas University Medical Center and lead investigator of the study claimed that: "Within minutes of the ban, it is going to start having an effect on heart attacks." Meyers was quoted as supporting his claim with the following argument: "Heart attacks are caused in large part by blood clots. With 20 minutes or so of tobacco smoke exposure, people’s blood becomes hypercoagulable and sticky and clots easily, and bam, you have a heart attack." I criticized the study's conclusions on a number of grounds, including the fact that no control or comparison groups were examined, so that there was no way to determine whether the 17% decline in heart attacks might have occurred anyway, even in the absence of the smoking bans. I also noted the severe weaknesses in the underlying studies and the fact that the review only included published data, while ignoring a large body of unpublished data which refutes the study conclusion, while employing much larger sample sizes and thus having greater validity. As it turns out, the study findings were due to a careless error. In the original study, the authors had inadvertently reported the Pueblo study has having reported a 70% reduction in heart attacks (a result that is completely implausible and clearly should have been noticed as having been in error). Instead, that study actually reported a 34% reduction in heart attacks. The meta-analysis authors published a correction in which they re-analyzed the correct data. It turns out that the 11 studies did not find a 17% reduction in heart attacks, but only found an 8% reduction in heart attacks. This level of decline in admissions for heart attacks is obviously not significantly different from the levels of decline in heart attacks that are being observed in the absence of smoking bans, which have varied between 5% and 10% per year in many communities. For example, in the United States as a whole, heart attack admissions declined by 8.2% in 2004. The decline of 8% in communities/nations with a smoking ban is comparable to this. Therefore, the meta-analysis result fails to provide any evidence that the smoking bans resulted in a decline in heart attacks. The failure of the meta-analysis to include any comparison groups is a fatal flaw that is indicative of very poor analytic methods. For example, we know that hospital admissions for heart attacks decreased by 28.5% in Nebraska in 2004 and by 12.5% in South Carolina during the same year. These are states without statewide smoking bans or even local smoking bans in place during 2004. Thus, it is obvious why it is essential to include a control or comparison group in conducting a meta-analytic review of these studies. One needs to be able to separate out the effect of the smoking ban from the secular decline in heart attacks that is being observed anyway. But even without the comparison group analysis, the meta-analysis - as it stands - fails to provide any evidence that smoking bans resulted in a decline in heart attacks. The observed 8% decline in heart attack admissions could easily be indicative of the underlying decline in heart attacks, which was at exactly the same level (8%) in 2004, which is the approximate time of many of the studies included in the meta-analysis. Predictably, this correction of the error in the meta-analysis has received no media attention. No effort was apparently made to disseminate the revised results. Of course not, because they are less favorable to anti-smoking groups. Remember, it's not the truth that 's important, it's whether the results are favorable or not. So once again, I offer a prize to any anti-smoking group which originally disseminated the results of the meta-analysis - reporting a 17% decline in heart attacks associated with smoking bans - and which now corrects that error and publicly disseminates the correct finding: that the actual decline was only 8%, which is not significantly different from what is occurring anyway in the absence of smoking bans. Since I am so sure that no groups will respond to this challenge, I will increase the size of the award to $200. The money is not at risk because these anti-smoking groups are really not interested in scientific rigor and accuracy. They are interested in presenting favorable data which supports their agenda. While I largely share and support that agenda, I do not share and support the tactic of misleading the public in order to achieve these goals. The Food and Drug Administration (FDA) - the lead federal agency which is in charge of regulating the safety of tobacco products which kill hundreds of thousands of Americans each year - is still not sure that these deadly products are any more hazardous than electronic cigarettes, according to a communication sent out by the FDA. According to the communication: "There may be a perception that electronic cigarettes...are safer alternatives to conventional tobacco products. ... However, FDA is not aware of any scientific data to support those perceptions." In other words, the FDA is not sure that cigarette smoking is any more hazardous than using a product (e-cigarettes) which contain absolutely no tobacco, does not burn tobacco, and delivers primarily nicotine and propylene glycol without the thousands upon thousands of chemicals - including more than 40 known carcinogens - that are present in cigarettes. The FDA is not sure that cigarette smoking is any more hazardous than using a product which its own laboratory has shown contains only trace levels of tobacco-specific nitrosamines, carcinogens which are present at a concentration of about 1,400 times higher in your typical Marlboros. The FDA is not sure that cigarette smoking is any more hazardous than using a product for which - with the exception of one brand - there is not a single known exposure (other than the nicotine) that has credibly been even postulated to significantly harm human health. The FDA is not sure that cigarettes - which deliver nicotine along with more than 10,000 other chemicals and more than 40 known carcinogens - are any more dangerous than electronic cigarettes - which deliver nicotine without nearly any of the other 10,000+ chemicals and carcinogens. If this is the way the FDA is going to respond to its new authority to regulate tobacco products, then it's off to an unfortunate start. Is this really the way we want our federal health agencies to treat tobacco products? As a product that is of such little concern that it may be no more harmful than the combination of nicotine and propylene glycol in an electronic cigarette? Is this the message we want going out to smokers? That their smoking is perhaps no more dangerous to them than if they quit smoking and instead used a product that only delivers nicotine without the tens of thousands of other chemicals? The FDA is essentially saying that ex-smokers who have quit smoking using electronic cigarettes might as well revert back to smoking, since the Agency is not aware that vaping is any less hazardous than smoking. Is this the kind of scientific-based advice that we think is appropriate to be coming from a federal health agency? The rest of the story is that this assertion by the FDA appears to be more politically-based than science-based. President Obama, in his inaugural address, called for a return of science to public policy. He asked that science be restored to its rightful place. However, the assertion that cigarette smoking is not known to be any more harmful than inhaling the vapors produced by putting an electric current through a solution of nicotine and propylene glycol is hardly something that can be viewed as science-based. Especially when the e-cigarette cartridges have already been studied in a number of laboratories and found to contain only trace levels of carcinogens and with the exception of one brand, no other toxic chemicals of any significant concern have yet been identified. If the FDA is not sure that removing all of the carcinogens from cigarettes - and reducing their concentrations to no more than trace levels - is going to make "smoking" safer (even forgetting the fact that there is no smoke and no combustion associated with vaping), then one has to ask whether the FDA is basing its positions only on science, and not on any political or ideological concerns. Think of it this way: Individual X has smoked 2 packs per day for 30 years. She has tried, unsuccessfully, to quit smoking using the nicotine patch and nicotine gum. Finally, she has successfully quit smoking using electronic cigarettes. What the FDA is stating is that it does not believe that it would be any worse for individual X to resume cigarette smoking than for her to remain an ex-smoker by continuing to vape. The FDA is stating that it is aware of no evidence to suggest that returning to cigarette smoking would be an unwise decision for this individual. That sounds like something the tobacco industry would say if asked to comment about electronic cigarettes. And to its credit, even the tobacco industry has not made any such statement. Instead, the federal government has helped protect the tobacco market by making this unscientific statement for them. Is this really the kind of pure scientific expertise - unclouded by any ideological or political concerns - that we want to be making the critical decisions about how to regulate tobacco products which are killing hundreds of thousands of Americans each year? It doesn't take a rocket toxicologist to recognize that electronic cigarettes have to be a safer alternative to cigarette smoking. Based on the laboratory testing that has been conducted, the presence of the product on the market for more than 3 years without any recognized adverse effects, the demonstrated absence (or presence at only trace levels) of carcinogens present in high concentration in cigarettes, and the absence in of any suspected toxin or carcinogen that has been identified and thought to cause disease, how could it be opined that switching back to traditional cigarettes from this product is a reasonable decision? There is plenty of research that needs to be done on electronic cigarettes. Clinical trials are clearly warranted. However, the need for such research does not equate to asserting that there is no evidence to indicate that vaping is as hazardous as cigarette smoking. You don't need to make the latter statement to support the first opinion. Making it clear that further research is necessary does not necessitate that one also opine that there is no evidence that the novel product is any safer than cigarettes. In fact, if there was no evidence to suggest that e-cigarettes are safer than cigarettes, then it would be unethical to conduct a clinical trial on this product. No IRB in its right mind would allow people to be used as guinea pigs to find out whether a company's whim that a product might be helpful is correct in the absence of any idea whether that product is safer than or potentially much more hazardous than the alternative products. Of course we have evidence that electronic cigarettes are safer than traditional ones. That FDA fails to appreciate this is very concerning, especially given concerns over the politicization of the agency and the fact that the FDA is the agency that has been given authority over tobacco products. Action on Smoking and Health (ASH) is claiming that the vapor exhaled by electronic cigarette users causes heart attacks in nonsmokers because of the nicotine exposure it creates among these bystanders. In a press release issued yesterday and entitled "NJ Poised to Ban E-Cigarettes in Public // Second State to Protect Bystanders From Heart Attacks," ASH wrote: "New Jersey is poised to become the second state to ban the use of e-cigarettes [e-cigs] in public places where smoking is already prohibited, with the New Jersey Senate set to vote today on a bill already passed unanimously by the Assembly. A primary purpose, says Action on Smoking and Health (ASH), the antismoking organization which supplied a detailed report supporting the bill, is to protect bystanders who otherwise are at possible risk from heart attacks, just like those inhaling secondhand tobacco smoke. ... As many studies have found, exposure to even small amounts of drifting tobacco smoke can trigger a heart attack in nonsmokers in as little as 30 minutes. Since a major cause of the heart attacks is nicotine, the main component of the vapor exhaled by e-cig users, those in the vicinity of e-smokers appear to be at similar risk." The claim being made by ASH is completely unsupported by scientific evidence. There simply is no scientific evidence to support the assertion that secondhand vapor from electronic cigarettes is a cause of heart attacks in nonsmokers. Not only is the claim unsupported by any evidence, but there is not any existing evidence that several necessary facts asserted by ASH are true. First, in order for secondhand vapor to cause heart attacks in nonsmoking bystanders, the exhaled vapor would have to contain appreciable amounts of nicotine. There is no evidence that the exhaled vapor contains any significant amount of nicotine. The lungs are fantastic at extracting nicotine (this is why cigarettes are such an effective nicotine delivery device). We know that in the exhaled smoke from smokers, the level of nicotine is extremely low. Secondhand smoke itself does not expose nonsmokers to high levels of nicotine. Second, in order for secondhand vapor to cause heart attacks, the exposure to nicotine among nonsmokers would have to be significant. Even if the vapor contained nicotine, it would be highly diluted by the time it reached the nonsmoker. The vapor dissipates almost instantly, and there is no evidence that there is any meaningful exposure to nicotine among nonsmoking bystanders. Third, in order to conclude that secondhand vapor causes heart attacks, brief nicotine exposure would have to be shown to be a cause of heart attacks in nonsmokers. There is no evidence that this is the case. The platelet aggregating effects of tobacco smoke are apparently due to the combination of many particulate components of the smoke. There is no evidence that nicotine in isolation causes the effects that would be expected to trigger a heart attack. The rest of the story is that ASH is making a health claim that is completely unwarranted, unjustified, and unsupported by the scientific evidence. It is literally a hysterical claim that has no basis whatsoever in science and is apparently based entirely in advocacy. By making such a claim, ASH is putting the reputation of the entire anti-smoking movement at risk. It's like the boy who cried wolf. If the public sees that this claim is hysterical and pure hype, then what is going to prevent the public from having the same reaction when anti-smoking groups deliver accurate information that we really need the public to accept (such as the dangers of exposing children to secondhand smoke). This unscientific hysteria threatens the scientific credibility of the entire tobacco control movement. I believe it is the responsibility of all anti-smoking groups to speak out against this inappropriate tactic, and publicly refute the claim that ASH is making. By being silent, anti-smoking groups are actually complicit in the deception of the public. Unfortunately, other than groups like ACSH and Smokefree Pennsylvania, none of the anti-smoking groups will speak out. Why? Because criticism is simply not acceptable in the movement and because the scientific integrity of the movement has deteriorated to the point where accurate science is no longer important. Nobody really cares because it is the agenda that is now driving the science, not the science that is driving the agenda. So I feel confident in putting up a $100 offer to the first anti-smoking group (other than ACSH or Smokefree Pennsylvania) which publicly refutes the claim that Action on Smoking and Health is making. There is no way that I am going to have to pay up because these groups simply do not care about the actual science anymore. The annual report of the Chief Medical Officer for Wales for 2008 was released yesterday and as anticipated, it concluded that the smoking ban in Wales resulted in a decline in heart attack admissions. The conclusion was widely disseminated. According to an article published by BBC News, entitled "Heart Attacks Fall After Smoking Ban, Report Says": "The number of people suffering heart attacks has reduced since the smoking ban in Wales began, a report by the chief medical officer has found. ... Dr Jewell's annual report Preventing the Preventable pointed to statistics which showed the number of hospital admissions for heart attacks in 2007/2008 had fallen by 3.7% on the previous year, down from 4,324 to 4,164." According to another article in the Daily Post, entitled "Smoking Ban Sees Fall in Heart Attacks in Wales," the smoking ban in Wales has resulted in a steep decline in heart attacks. The announcement of this finding was heralded by ASH Wales, which stated: "Bans on smoking in enclosed public places have been demonstrated to effectively reduce heart attack rates so it is not surprising to see Wales following this positive trend." According to the article: "New figures this week are expected to reveal how the first full year of the public smoking ban in Wales heralded a steep decline in heart attacks. The findings will be contained in the Chief Medical Officer for Wales’ annual report showing hospital admissions have fallen since the ban came into force." The specific findings highlighted in the article are as follows: "There was a 12.5% fall in the number of patients admitted to hospital with a heart attack between October and December last year, compared to the same period in 2006, before the ban on smoking in enclosed public spaces was introduced in Wales: some NHS trusts have seen the number of heart attacks fall by up to 40% in the same period." "Although we are not likely to see the full health benefits of the legislation for some time, for instance an anticipated reduction in lung cancer, there is already some evidence that the ban is having a beneficial effect on health. Hospital admissions for heart attacks were reduced in 2008 and although this decline cannot be wholly attributed to the smoking ban, some studies suggest that at least some of the reduction is due to the legislation." No other data were presented in the report regarding the relationship between the smoking ban and the trend in heart attacks. It is unfortunate that the annual report concluded that the smoking ban resulted in a decline in heart attacks in Wales but failed to present any data to back up that conclusion. Even allowing the benefit of the doubt and accepting that there was a 3.7% decline in heart attacks in Wales from 2005/2007 to 2007/2008, this pretty much means that there was no effect of the smoking ban on heart attacks, since the number of heart attack admissions was dropping by between 5% and 10% annually prior to the implementation of the smoking ban. By failing to mention the baseline trend of declining heart attack admissions in Wales, the article (and the public officials and health groups contributing towards this distortion of the science) gives a misleading impression. Rather than causing an acceleration in the pre-existing rate of decline in heart attacks, it appears that the smoking ban was associated with a leveling off of that decline. Of course I'm not arguing that the smoking ban increased the number of heart attacks. But it is difficult to see the basis for any credible conclusion that the smoking ban had any effect whatsoever on heart attacks. Clearly, the conclusion of the report is not justified on the basis of the scientific facts. Fortunately, thanks to Christopher Snowdon over at Velvet Glove Iron Fist, we know that annual data on emergency room heart attack admissions are available from Health Solutions Wales. These data present the annual number of heart attack admissions for all of Wales, with the year-long periods starting in April of one year and going through March of the following year. This is convenient, since the Wales smoking ban went into effect in April 2007. Thus, any effect of the ban on heart attacks would be expected to show up in the 2007/2008 and 2008/2009 data points. I created a graph of the trends in emergency room heart attack admissions in Wales from 2003/2004 through 2008/2009. The arrow shows the point at which the smoking ban went into effect. The graph clearly shows that contrary to the conclusions of the report, as well as the conclusions of ASH Wales, the smoking ban was not associated with any decline in heart attacks. In fact, the data demonstrate that the smoking ban was associated with a leveling off of the trend of declining heart attacks in Wales. In other words, in the two years since the Wales smoking ban has been in effect, there have been more heart attacks than would have been expected based on the pre-existing trends in heart attacks in the country. This doesn't mean that the smoking ban increased the number of heart attacks, but it does refute the conclusions of the Institute of Medicine and many anti-smoking groups that smoking bans result in an immediate and dramatic reduction in heart attacks. Although the Institute of Medicine committee was made aware of the data from Wales, it chose to ignore these data. In essence, the committee cherry-picked the data which supported its conclusion and ignored the data which refuted it. Unfortunately, the data which the committee ignored were the more reliable data, because they were based on large populations. The few studies that drove the committee's findings were conducted in small communities with small numbers of acute coronary events and huge year-to-year variations in heart attacks. These data from Wales are quite convincing and demonstrate that on a national level, the smoking ban was not associated with any decline in heart attacks. I once again challenge anti-smoking groups to disseminate these findings, and I again offer a $100 prize to any group that previously disseminated the conclusion that smoking bans immediately reduce heart attacks and which now publicizes these findings which refute that conclusion. Of course, I realize that these anti-smoking groups are not interested in the truth; they are only interested in conclusions that are favorable to their position. Thus, I feel confident that I need not worry about losing the hundred bucks. Christopher Snowdon has conducted a similar analysis to mine and has reached the same conclusion: the Wales smoking ban clearly did not result in any decline in heart attacks. 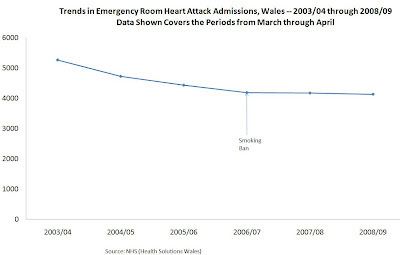 Snowdon's graphs also demonstrate that if anything, the smoking ban resulted in a leveling off of the previous trend of rapidly declining heart attacks in Wales. You can read Christopher Snowdon's comprehensive discussion of the Wales data at these sites: Post 1; Post 2. The rest of the story is that contrary to the conclusions being disseminated by the media due to misleading data and distorted science by anti-smoking health officials and anti-smoking advocacy groups, the smoking ban in Wales clearly failed to result in a decline in heart attacks during its first two years. While the Chief Medical Officer is absolutely correct that eventually the cardiovascular benefits of the smoking ban will be seen, it is simply too early to expect to see a decline in heart disease due to a reduction in secondhand smoke exposure. The reliance upon shoddy science regarding the short-term effects of smoking bans on heart attacks has become a rapidly deteriorating aspect of the scientific integrity of the tobacco control movement. Despite repeated pleas and warnings to restore more rigorous scientific standards, which I have been issuing for the past three years, the movement has failed to respond. As a result, data such as that being released today clearly refutes the conclusions that the anti-smoking groups have disseminated. They jumped the gun, and it turns out that they were wrong. That they were wrong because of a strong bias is regrettable. That they fail to correct themselves in light of clear evidence of the invalidity of their conclusions is worrisome. That they don't appear to even care whether they are distorting the science and misleading the public is inexcusable. A new report issued by the Substance Abuse and Mental Health Services Administration (SAMHSA) indicates that nearly half of adolescent smokers (ages 12 to 17) are smoking menthol-flavored cigarettes, a finding which calls into question the sincerity of the leading anti-smoking groups in wanting to actually do something to address the problem of youth smoking. While the leading anti-smoking groups - led by the Campaign for Tobacco-Free Kids, American Cancer Society, American Heart Association, American Lung Association, and the American Medical Association - lobbied Congress to ban most flavored cigarettes, they specifically asked policy makers not to get rid of menthol cigarettes. However, these new data show that nearly half of adolescent cigarette use is attributable to the smoking of menthol-flavored cigarette brands. In contrast, the Family Smoking Prevention and Tobacco Control Act - which was purported by these same anti-smoking groups to have curtailed the tobacco industry's ability to addict our nation's youths - resulted in the removal of exactly zero Big Tobacco flavored cigarette brands from the market. According to the report, which summarizes findings from the 2008 National Survey on Drug Use and Health, 47.7% of 12-17 year-old smokers smoked menthol cigarettes in 2008, which is an increase from the 43.5% who smoked menthol brands in 2004. Among African American smokers (ages 12 and older), the proportion using menthol cigarettes was 82.6%. Thus, menthol-flavored cigarettes account for the overwhelming majority of cigarette use among African Americans. The use of menthol cigarettes was found to be particularly important in the smoking initiation process. Among adolescents who were in the process of starting to smoke (past year initiates), menthol-flavored cigarette use was 49.2%. Among teens who had started smoking more than one year ago, menthol cigarette brand use was 43.8%. The report concludes that menthol is an important contributor to adolescent smoking - especially to the smoking initiation process - and that it enhances smoking initiation by masking the harshness of cigarette smoke. It also notes that menthol cigarettes make it more difficult to quit smoking. If the leading anti-smoking groups were sincere in their statements indicating that they believe flavored cigarettes need to be taken off the market in order to curtail the ability of cigarette companies to entice youths to smoke using these flavorings, then they most certainly would have wanted to ban menthol cigarettes, which we now know are responsible for about one-half of all adolescent smoking. However, rather than pushing for menthol to be included in the Family Smoking Prevention and Tobacco Control Act's prohibition on flavored cigarettes, the Campaign for Tobacco-Free Kids actively lobbied to prevent Congress from including menthol cigarettes in the flavoring ban. Thus, the anti-smoking groups worked hard to make sure that the legislation would have little effect on youth smoking. And they apparently knew full well that their efforts were nothing more than a political ploy - designed to make it look like they had done something to curb youth smoking when in fact they knew they were doing virtually nothing. With any degree of sincerity about addressing the youth smoking problem, a public health group advocating for the elimination of flavored cigarettes would surely not work to protect the one cigarette flavoring which is most responsible for youth smoking and which, we now know, is actually responsible for half of all cigarettes smoked by adolescents. Irrespective of the wisdom of regulating cigarette flavorings in the first place, I think we can all agree that any group being sincere in its statement that flavorings are contributing to youth smoking and therefore need to be banned would not proceed to try to protect the one flavoring that is actually used by about half of all teens who smoke. The Family Smoking Prevention and Tobacco Control Act turns out to be little more than a thinly-veiled attempt to allow anti-smoking groups to boast to their constituents that they are really doing something to protect our nation's youth when in fact, they failed to have the political courage to actually do the one thing that would have made a difference: getting rid of the flavoring that we now know accounts for half of all youth smoking initiation. In my opinion, these groups have abandoned the principles of public health protection and sacrificed their scientific and ethical integrity in order to achieve political and financial gain. In the end, they sacrificed the health of our nation's children - and especially our African American children - in order that they might be able to "show off" to their constituents. In the midst of the deterioration of these major anti-smoking groups into little more than political propaganda machines, there is one group which deserves a shout out for having the integrity to be willing to actually confront the problem, rather than just talk about it: The American Legacy Foundation had the courage to call for a ban on menthol cigarettes. That is a group which appears to be sincere about its desire to address the problem of youth smoking. In contrast, the Campaign for Tobacco-Free Kids, ALA, ACS, AHA, and AMA have disintegrated into political propaganda tanks, with apparently no true desire or courage to confront the actual problem. Perhaps this shouldn't come as a surprise. The American Legacy Foundation is the one group of the list that doesn't rely upon private contributions from constituents. It's amazing what a difference it makes when you take the desire for money out of the picture. According to an article in the Daily Post, the smoking ban in Wales has resulted in a steep decline in heart attacks. The announcement of this finding was heralded by ASH Wales, which stated: "Bans on smoking in enclosed public places have been demonstrated to effectively reduce heart attack rates so it is not surprising to see Wales following this positive trend." Despite extensive searching, I was unable to find - as of this time - any report, any study, any data, or even any summary of data from the office of the Chief Medical Officer related to changes in heart attacks in Wales associated with the smoking ban. It appears, then, that what was released to the media was not a press release reporting that there was a decline in heart attacks due to the smoking ban, but an announcement that there will be - at some point in the future - a release of a study showing such an effect. This is even worse than "science by press release" because not only are the authors of the study not sharing the actual study, but they are not even sharing the data or the findings themselves with the public. We just have to take it on faith that there exists a study which contains data that show an effect of the smoking ban on heart attacks. Not only is the public unable to scrutinize the study, it is also unable to scrutinize the data or the findings of the study. So this is a complete co-optation of the media to spread a message, while avoiding any kind of scientific scrutiny. Even if it turns out later that the data or findings are completely bogus, it will be too late. The conclusion has already been widely disseminated. Why even bother reporting the science any more about smoking ban and heart attack studies? Why not just report the fact that there will be announcements in the future that studies have been done indicating an effect of smoking bans on heart attacks? Then we could put this whole issue to rest and wouldn't have to worry about actually examining the research. Anti-smoking groups appear to be getting more and more sly in their apparent desire to avoid public scrutiny of their conclusions. Now, they simply issue announcements that they are going to, at some point in the future, announce the findings of a study showing the effect of smoking bans on heart attacks, and they think that should be enough for us all to accept their conclusions on faith. When and if the actual study on the effect of the Wales smoking ban is released, The Rest of the Story will cover it and provide an analysis. Data I am reporting here for the first time today reveal that there has been no change in the trend of heart disease deaths in Connecticut during the first three years of its comprehensive smoking ban, which covers all workplaces, including restaurants, bars, and bowling alleys. Connecticut's smoking ban was implemented in two phases. As of October 1, 2003, all workplaces, including restaurants, became smoke-free. Taverns, cafes, and bowling alleys became smoke-free on April 1, 2004. There had been very few smoke-free laws in Connecticut prior to the state law. Thus, in a short window of time in late 2003 and early 2004, Connecticut experienced a drastic change in smoke-free policy, going from virtually no bans on smoking in bars and restaurants to a complete ban in all of these establishments. The only exception was for private clubs which were in existence prior to the ban. Actually, according to Americans for Nonsmokers' Rights, there were no local smoking bans in effect in Connecticut prior to the statewide smoking ban. This is because Connecticut has a preemption clause in its statute, which prohibits cities and towns from regulating smoking in public places. Previous studies have been criticized because the smoking ban at the statewide level may have replaced numerous local ordinances, and thus the change in smoke exposure was not as drastic as it may have seemed. Connecticut is an ideal place to study the specific effects of a statewide law because there was no pre-existing local protection. Because heart disease death statistics are available from the state of Connecticut through the year 2006, we now have three full years following the smoking ban in which to observe any changes in heart attack deaths that may have resulted from the ban. Data available from the Connecticut Department of Public Health for the years 1999 to 2006 were examined to ascertain the annual death rate from ischemic heart disease. This includes deaths from heart attacks and angina. The graph shows that there was no change in the trend in heart disease deaths in Connecticut associated with implementation of a comprehensive smoking ban, at least during its first three years. In the year prior to the smoking ban (2002-2003), the rate of heart disease deaths in Connecticut declined by 6.9%. In the first three years after the smoking ban (2003-2006), the average annual rate of decline in heart disease deaths in Connecticut was 6.9%. Thus, there was literally no change in the rate of decline in heart disease deaths during the first three years of the comprehensive statewide smoking ban in Connecticut. The year-specific declines in heart disease deaths during the post-ban period were 8.2%, 5.5%, and 6.9%. Lest someone call out the 8.2% decline from 2003 to 2004 as somehow indicative of a dramatic effect of the smoking ban, the decline in heart attacks from 2000 to 2001 in Connecticut was 8.3%. Thus, it is clear from these data that there is no indication of any significant decline in heart disease deaths in Connecticut associated with implementation of the comprehensive smoking ban during its first three years, in a setting in which there were no prior local smoking bans. These data do not demonstrate that the statewide smoking ban in Connecticut failed to produce significant health improvement. The most immediate effects of smoking bans are a reduction in acute respiratory symptoms and disease, especially symptoms associated with asthma and other respiratory diseases. Over a long-term period, reductions in heart disease and lung cancer will eventually occur. However, what these data show is that the claims made by numerous anti-smoking groups -- and even by the Institute of Medicine panel that examined this issue -- are not borne out in large populations. These groups have claimed that smoking bans result in immediate and dramatic reductions in heart attacks due to reduction in acute tobacco smoke exposure. They have supported these assertions by opining that even brief exposure to secondhand smoke can cause heart attacks. Unfortunately, none of the studies which have examined large populations - such as states or countries - have borne out this hypothesis. What appears to be the case is that researchers have selectively chosen a few communities where - either by chance or due to declining trends in heart attacks - a decline in heart attacks was observed in association with a smoking ban. The only studies which have systematically examined the relationship between smoking bans and heart attacks in a number of areas have failed to find a significant effect. Today's result from Connecticut provides further evidence that, as one would expect based on the underlying science, smoking bans are not going to result in immediate, dramatic declines in heart attacks. It's unfortunate that the Institute of Medicine committee failed to examine even a fraction of the easily available data from state health departments that could have been used to assess the relationship between smoking bans and changes in heart attacks. My analysis of the data from Connecticut, which took all of about ten minutes, reveals that even in the setting of having no pre-existing local smoking bans, the implementation of a comprehensive smoking ban which included all bars and restaurants failed to result in any significant decline in heart attack death rates within its first three years. Once again, I ask the question: will anti-smoking groups disseminate these data from Connecticut, or will they continue to cherry-pick the data which supports their position? And my offer still stands: the first anti-smoking group that previously reported an effect of smoking bans on heart attacks and which now reports these data from Connecticut will receive a $100 prize in the form of a donation to that organization. Of course, I'm not at all worried about losing my money because it's very clear to me that these anti-smoking groups aren't really interested in the truth. They are interested in cherry-picking data which supports their pre-determined conclusions. While they may feel that in the short-term they are serving the anti-smoking or smoke-free cause, they are deceiving themselves. Relying on shoddy science and biased analysis to promote a supposedly science-based policy is eventually going to backfire, and in a huge way. Once the credibility of a social movement is lost, it is almost impossible to recover. Unless anti-smoking groups want to read about themselves in the papers the way we're now hearing about the shoddy science of some global warming scientists, they need to abandon their biased reporting of the science and begin to separate the science from the agenda. As I've said before, proving that smoking bans reduce heart attacks within a one to two-year period is not necessary to advocate successfully for these bans. But making claims that are unsupportable will eventually make it difficult to get any smoking bans enacted. Once the credibility of a movement is lost, it is close to irretrievable. In a press release issued yesterday, Action on Smoking and Health (ASH) encouraged electronic cigarette users throughout the nation to file or join in lawsuits against sellers of e-cigarettes, charging that these products are in violation of consumer safety laws because they have been found to contain hidden carcinogens. "In response to requests for legal assistance he is receiving from persons who purchased e-cigarettes based upon claims of safety, who subsequently learned that an FDA study showed that they contained deadly toxins and cancer-causing chemicals, Prof. Banzhaf has posted on line a template for drafting a class action law suit complaint against sellers of e-cigarettes. With this simple template, any attorney contacted by an e-cigarette purchaser can easily file his or her own new law suit. This could be important because the plaintiffs and the attorneys who are the first to file class action product liability law suits often end up with the lion’s share of money recovered — including attorney’s fees — so a race to the courthouse to be the first to file in each state is quite possible, says Prof. Banzhaf." "The FDA has reported that the e-cigarettes it tested contained detectable levels of known carcinogens and toxic chemicals to which users could potentially be exposed." Actually, what the FDA report showed was that electronic cigarette cartridges contain only trace levels of carcinogens, thus validating the e-cigarette sellers' claims that these products are safer alternatives to smoking. While cigarettes are loaded with tobacco-specific nitrosamines and more than 40 other carcinogens, e-cigarettes have been found to contain only trace levels of nitrosamines. No other carcinogens have yet to be identified in these products. Thus, the FDA report actually provides evidence that there is no fraud going on here, and that e-cigarette users have no valid claim against the sellers. Since ASH apparently believes that the presence of trace levels of carcinogens in e-cigarettes warrants widespread lawsuits, the same philosophy should also hold for nicotine replacement products, since the nicotine patch and nicotine gum also contain detectable levels of carcinogens about which consumers have never been informed. According to ASH, these "hidden carcinogens" would therefore warrant class action lawsuits against drug manufacturers for violation of consumer protection laws. Interestingly, ASH is not promoting lawsuits against the pharmaceutical companies who market nicotine replacement products without informing their customers that these products contain detectable levels of carcinogens. Why this double standard? Perhaps the answer lies in the fact that ASH is heavily funded by Big Pharma. ASH is funded heavily by Big Pharma (specifically, by Pfizer - the maker of Chantix). If e-cigarettes really take off, they represent a huge threat to the profits of pharmaceutical companies, and in turn, they represent a threat to future funding of ASH. This conflict of interest is significant, but ASH has failed to disclose it in any of its statements about the dangers of electronic cigarettes, or in its propaganda designed to encourage vapers to sue e-cigarette companies. I find it unethical of ASH to try to drum up lawsuits against e-cigarette companies without disclosing ASH's financial interest in these lawsuits. Since e-cigarettes and pharmaceutical smoking cessation aids are direct competitors, ASH is hiding a significant financial conflict of interest in failing to disclose its funding by Pfizer. Thus, I believe ASH is doing a disservice to potential clients that it is trying to attract by failing to inform them of the organization's financial affiliation with Big Pharma. If there is any deception going on here, if there is anything hidden, it is actually the secret financial relationship between ASH and Pfizer, which ASH has failed to reveal, even though I believe it has an ethical obligation to disclose this conflict of interest in communications which try to drum up lawsuit plaintiffs. And if lawsuits against e-cigarette sellers are warranted, then so are lawsuits against nicotine replacement drug makers. Those products also contain trace levels of carcinogens about which consumers have not been informed. Why is ASH so hell-bent on destroying electronic cigarettes? Why would ASH want to get these products off the market so that hundreds of thousands of ex-smokers will be forced to return to smoking? Perhaps it is because ASH simply cannot stand the thought of someone going through the physical act of what appears to be smoking, even if that act is potentially going to save the person's life. Data I am reporting here today from the Marion County Health Department indicate that the heart disease death rate in Marion County increased by 16% in the first year following implementation of the Indianapolis smoking ban. The ban, which affected all workplaces, including restaurants but excluding bars, went into effect on March 1, 2006. Had the smoking ban resulted in an immediate decline in heart attacks, as claimed by a number of anti-smoking groups and researchers and by a special Institute of Medicine committee, one would have expected the heart disease death rate in Marion County to have decreased in 2006, compared to 2005. Data from the Marion County Health Department, however, show that the age-adjusted heart disease death rate for Marion County actually increased by 16% from 2005 to 2006, going from 171.0 to 197.6 deaths per 100,000 population. This reversed a trend of declining heart disease death rates prior to the smoking ban. The rate had declined by 4.4% from 2002 to 2003, by 6.0% from 2003 to 2004, and by 5.8% from 2004 to 2005. Thus, the increase of 16% observed from 2005 to 2006 was a striking increase that coincided precisely with the implementation of the workplace and restaurant smoking ban. The Indianapolis yellow pages list more than 4,000 restaurants in the city; thus, one would expect that the decline in secondhand smoke exposure was substantial. If anti-smoking groups were correct that brief exposure to secondhand smoke is triggering heart attacks in many nonsmokers, there certainly should have been a decline in heart disease death rates within one year. At very least, one would not have observed a 16% increase in heart disease deaths. By the logic of many anti-smoking groups and researchers, and by the logic of the Institute of Medicine committee that reviewed this issue, the Indianapolis smoking ban resulted in an immediate and dramatic 16% increase in heart disease deaths. This increase was a striking departure from the consistent and stable trend of about a 4%-6% annual decline in heart disease deaths during the three previous years. Now, do I believe that the smoking ban in Indianapolis actually caused the observed increase in heart disease deaths? Of course not. But my point is simply this: by the logic being used by anti-smoking groups and researchers and by the IOM committee, these data demonstrate that the smoking ban caused a dramatic and immediate increase in heart disease deaths. You see, the anti-smoking groups can't have it both ways. They can't argue that when a smoking ban is associated with a dramatic decline in heart attacks, that decline was caused by the smoking ban, but when the ban is associated with an increase in heart attacks, that increase was not caused by the ban. The anti-smoking groups are truly in a catch-22 situation in trying to explain these data. If anti-smoking groups try to explain away this finding by arguing that the increase heart disease deaths was due to factors other than the smoking ban, then the same explanation could be used to argue that the observed decreases in heart attacks in other cities were due to factors other than the smoking ban. If anti-smoking groups defend the methodology and conclusions of previous studies, then they are forced to acknowledge that these data refute the conclusions of those studies. You can't just cherry-pick the findings you like and ignore those that don't support your hypothesis. Of course, that's exactly what the IOM committee did in reaching its conclusion. This story demonstrates why one cannot properly study this issue by analyzing data from a single community. One needs to systematically look at a large sample of communities with and without smoking bans, especially in areas with a large population. So far, the only study which has employed such a methodology has found no effect of smoking bans on heart attacks. Once again, I challenge those anti-smoking groups which have publicized data from other smoking ban/heart attack studies to publicize these data. Will anti-smoking groups only share with the public the findings which are favorable to them and their pre-determined conclusions? Or will they share relevant data which refute those conclusions as well? Are they interested in the truth, or are they just interested in data which supports their a priori position? Dr. Siegel is a Professor in the Department of Community Health Sciences, Boston University School of Public Health. He has 32 years of experience in the field of tobacco control. He previously spent two years working at the Office on Smoking and Health at CDC, where he conducted research on secondhand smoke and cigarette advertising. He has published nearly 70 papers related to tobacco. He testified in the landmark Engle lawsuit against the tobacco companies, which resulted in an unprecedented $145 billion verdict against the industry. He teaches social and behavioral sciences, mass communication and public health, and public health advocacy in the Masters of Public Health program.